As the last in a five book series, I would not suggest coming into Last Dragon Standing unfamiliar with the preceding books. 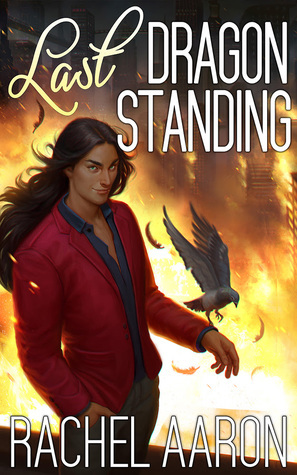 Although Last Dragon Standing didn’t entirely live up to my expectations, the Heartstriker series remains one of my favorite urban fantasy series out there. If you haven’t read it, I would strongly suggest reading the first book in the series, Nice Dragons Finish Last. Also, forewarning, there’s no way this review can avoid spoilers for the previous parties. At the end of the last book, Marci, Julius and assorted friends and allies were gathered in the DMZ as magic floods into the world and a Nameless End begins to devour our entire reality. Julius is trusting that Bob has a plan… but then they find out, it’s a really bad plan. Is it worth risking all possible futures for one not so great future? Or should they gamble against all the odds for a world where they and everyone else survive the Nameless End? I already mentioned that Last Dragon Standing didn’t entirely live up to my expectations, but to be fair, my expectations were pretty darn high. This series has been so amazing so far! Last Dragon Standing had a lot to live up to. Unfortunately, the beginning of the book felt like a let down. It’s just so slow! The entire beginning is everyone sitting in the DMZ, figuring out what’s going on, and trying to figure out a plan to get themselves out of it. Once they started actually fighting the Nameless End, things sped up, but it felt like it took forever to get to that point. Last Dragon Standing does give us a greater insight into Bob. He’s always operated on an entirely different scale than all the characters, and it’s clear why he hasn’t gotten much POV space. This entire series has been following his grand plan, and knowing it would ruin so much of the tension. But his plan is at an end, and all is revealed. We finally get Bob’s perspective. It’s been easy to be frustrated with him the last few books, but with his POV revealed, I did sympathize with him. As always with this series, I love the characters so much. Marci continues to grow and shine as a Merlin. Julius continues to empathize, to reach out to others, and to do what he thinks is right. And the supporting cast is wonderful too! Amelia is charming as ever, and I so want Chelsie to get her happy ever after. Although I found the pacing a bit uneven, I was ultimately happy with where this series ended. I’m also sad it’s over! However, Rachel Aaron says she is planning a new series in this same world. Even if it has all different characters (and man, I’d miss these characters), I find this world so creative and fun. And thankfully, I can always reread this series! I’m going to be heading into this one real soon – just finished A Dragon of a Different Color. Can’t wait to see how it all ends.